Who Is Hard Rock Park's New Owner? Since Mike has treated you to a flurry of 2009 brochures over the past couple weeks, I am going to kick it old school and take you BACK a decade or two! Now for the record, this is another one of those brochures whose year of publication is nowhere to be found. A little birdie--a very reliable one!--told me it's from the early '90s. But being the maniacal park history buff that I am, I couldn't resist the urge to dig a little deeper in an attempt to nail down an exact year. My conclusion? It's a toss-up between 1991 and 1992, but I am leaning toward the latter. These days, Waldameer is synonymous with Ravine Flyer II. But let me assure you that there have always been plenty of reasons to visit this park. Featured on the cover of this brochure is the park's veteran woodie, Comet. Waldameer is a veritable treasure trove of classic rides. A few of the rides pictured here, such as the Old Mill, now exist only in memories. But others, including the Whacky Shack and Pirate's Cove, can still be enjoyed at the park today. One ride which is not featured in this particular brochure--thus casting doubt on my year calculation--is the Sea Dragon, which debuted at Waldameer in 1992. 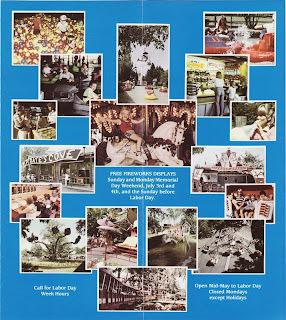 Normally I would expect a park brochure to be advertising the heck out of any new ride scheduled to open that year; but then again, it was a simpler time and Waldameer was a simpler park. The late '80s and early '90s saw a tremendous amount of funds being allocated to the expansion of Water World. In fact, it is this very spread which led me to the conclusion that this brochure must have been published in 1992. 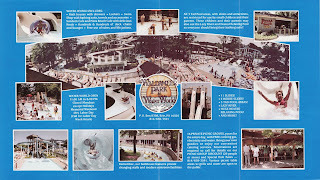 Per the ProSlide web site, Water World's Bermuda Triangle slide complex (lower left-hand corner) was installed in 1991. So it stands to reason that the park would not have photos of this attraction prior to its opening!! The 1992 season was pivotal for Waldameer, as it marked the beginning of a 10-year expansion plan which introduced many of the rides we've come to know and love. But Waldameer's expansion certainly did not end in 2002! The park will welcome a Mega Disk'O in 2009, and they plan to give YOU an opportunity to help name it. For more details on this upcoming contest (not to mention some wicked cool off-season photos and a plethora of fun park facts), be sure to follow the Waldablog!